If you're embedded with Apple devices, this simple-to-use camera offers great quality and good features. It can just be tricky to access when outside your home network. You’d be surprised at how complicated some home security cameras can be to set up and operate. D-Link’s Omna 180 is refreshingly different. You just need to be near it with an Apple device (that’s connected to WiFi) and the D-Link Omna app will detect it and connect. You just need to enter the Hub code and even that can be done automatically. This then secures it with end-to-end encryption to stop weirdos, hackers and Australian politicians spying on you. From this point everything works instantly. You can view the high quality live images, listen in on audio and even talk back to people within listening distance of the camera. 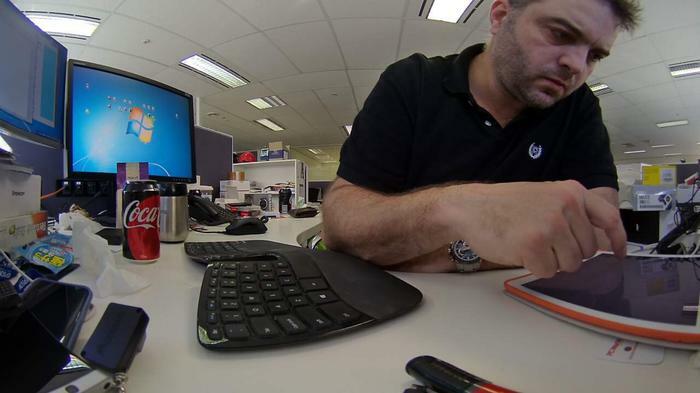 A 'dewarping' effect makes a fisheye 180-degree view look normal. Infrared allows the camera to work in the dark and check that the kids are in bed. There’s also a simple motion detection system which lets you choose which parts of a frame (and the sensitivity of change within them) need to be triggered in order to record video to – it’s stored on an unsupplied) microSD card which slots into the bottom. 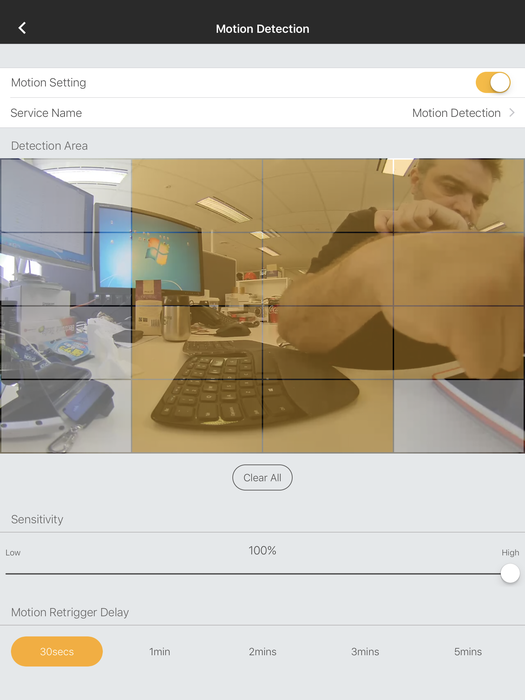 Motion detection is easy to set up. Footage is stored on a microSD card. The camera is also compatible with Apple’s Home app and this will notify you on the lock screen if motion has been triggered. 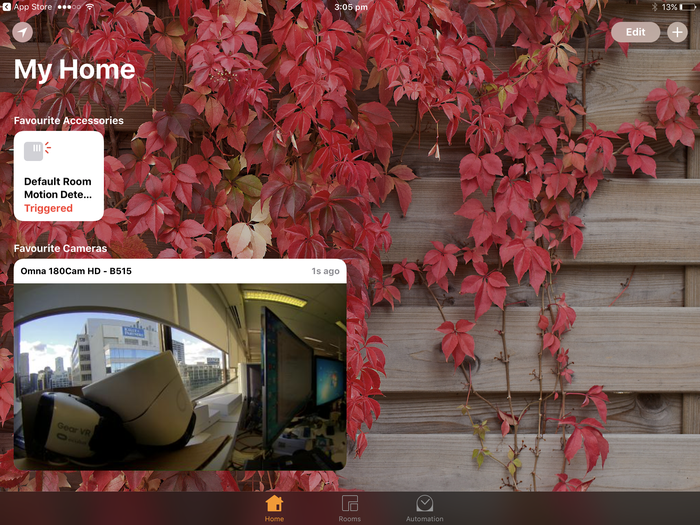 The camera is Apple HomeKit compatible so you can access it online remotely if you have a Home Hub set up. We found it worked very well and image quality was excellent. Even in the near dark, a usable image was captured thanks to an infrared mode. The main gripe is that it can’t natively be accessed outside of your own homw network – it would be great to check-in at home when out and about. However, you can set this up if you also have a full Apple Home Hub (using an Apple TV) up and running and can follow these instructions. It’s worth persevering, however. The ‘dewarping’ technology means that the fish-eye lens doesn’t provide an image that’s too distorted and dynamic bitrate means quality will adjust to what’s available when streaming to you. There are quite a few network cams around but this is certainly one of the simplest to use and with the highest quality too. It’s a shame it’s all Apple-only based and that you need an Apple TV to make the most of it, but if you already have that, it’s a great buy.